In this woodworking project video, I'll show you how to build a kid's step stool and, as a cool twist, I added my niece's artwork to the top step using epoxy resin. Let's get started! I built this step stool using scrap pieces of ¾” Maple plywood I had on hand, but you can get all of the pieces for this stool from a 2 foot by 4 foot piece of plywood from the home center. The first step was to cut the pieces to size, and I used the table saw and miter saw for this, but you could cut these pieces using a circular saw. After I had all of the pieces cut to size, I needed to cut the cutaway for the first step, the taper on the front and back edges of the sides, and the cutaway for the legs. I stuck the two sides together using double stick tape, so I could do all of the cutting at once. I laid out the cutaways based on the dimensions, which are listed in the plans. The plans also include a detailed cutlist, SketchUp file, and cutting diagram for breaking down the plywood. Ready to build your own Kid's Step Stool? Once I laid out all of the lines, I started cutting them on the bandsaw. 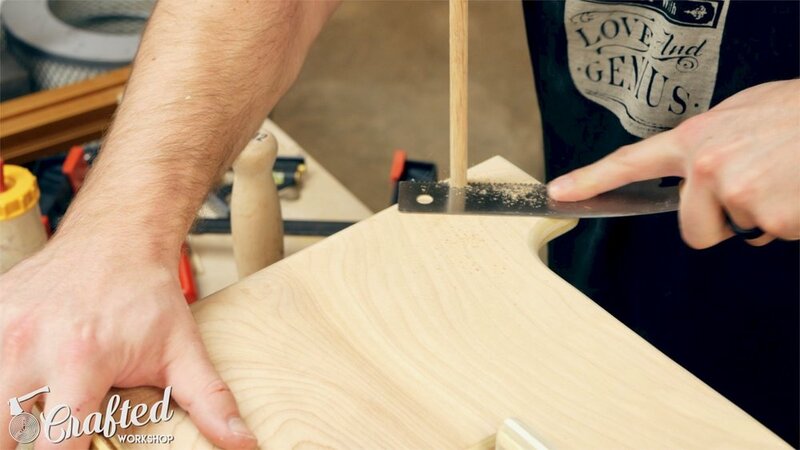 If you don’t have a bandsaw, you could definitely use a jigsaw instead. The first thing I cut was the cutaway for the first step. Next, I cut the tapers on the front and back edges of the sides. This isn’t really necessary, but gives the stool a cool look. For the leg cutaway, I decided to cut the curves in the corners using a 2” Forstner bit, then connected the lines with the bandsaw. This gives the corners of the curves a perfect, uniform look. I also had a thick resaw blade installed on my bandsaw, which doesn’t cut curves well, so this allowed me to avoid having to change my blade. Next, I rounded over the corners using the oscillating belt sander, then sanded all of the curves using a combination of hand sanding and a random orbit sander. Since this stool is for kids, I wanted to remove all of the sharp corners. With all of the shaping done, I separated the two sides and then rounded over all of the edges of the pieces using a ⅜” radius roundover bit on my router table. In retrospect, I shouldn’t have rounded over the edges where the sides met the steps, but it didn’t make a huge difference. To assemble the stool, I used a combination of pocket screws and dowel joinery. 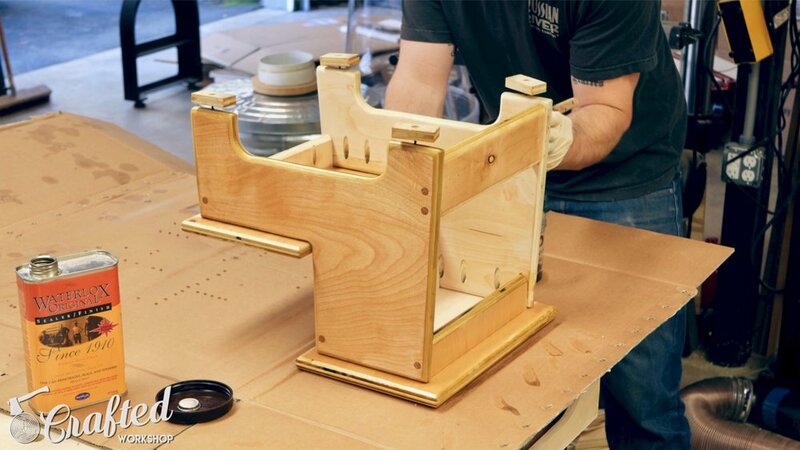 The support pieces are attached to the bottom of the steps using pocket screws, and the sides are attached to the steps using pocket screws as well. I assembled all of the pieces, and then drilled the holes for the dowels. I used ⅜” oak dowels, since that was what I had on hand, and drilled the holes using a ⅜” Forstner bit on the drill press. 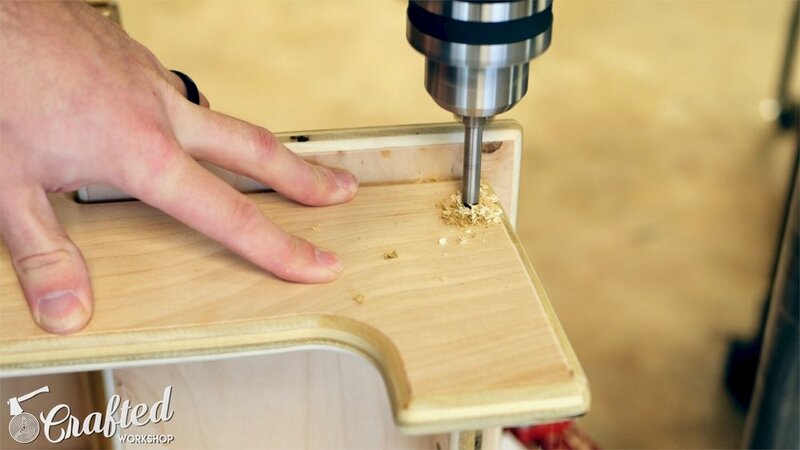 It is really important that these holes are drilled perpendicular to the sides of the stool, otherwise you might end up drilling through the sides of one of the pieces. 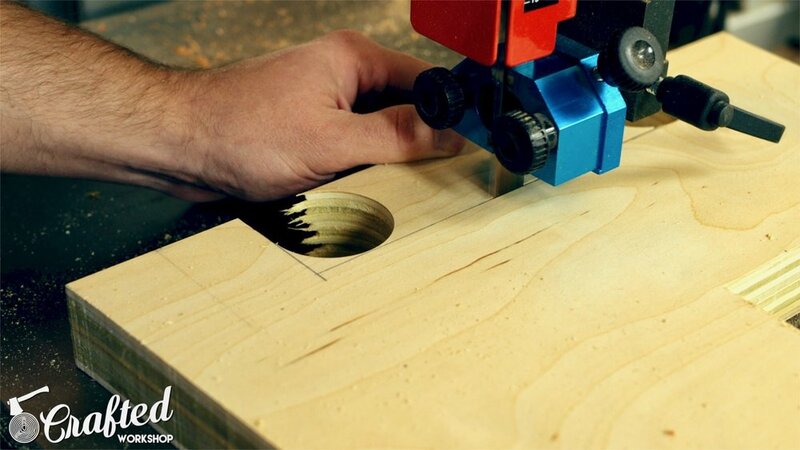 If you don’t have a drill press, you can use a cordless drill with a square to help make sure the holes are drilled perpendicular. Once all of the holes were drilled, I added glue to the holes, pounded in the dowels, and then cut them flush using a flush cut saw. 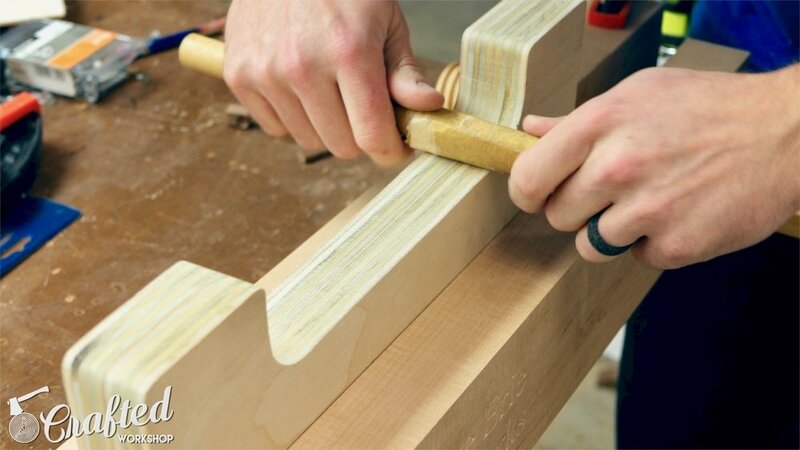 Once all of the dowels were added, I clamped all of the joints together to pull them tight. Next, it was time to add the artwork and epoxy to the top step. I attached my niece’s artwork using spray adhesive and then mixed up a batch of ArtResin epoxy. I poured one layer, spread it out, and then decided it needed a little more coverage so I mixed up another batch. ArtResin has a 45 minute open time, so you can pretty easily err on the side of mixing too little so you don’t waste any epoxy. If you want to learn more about ArtResin, click here. Once I poured the epoxy on, I used a propane torch to pop the bubbles and then let the epoxy cure for 36 hours. With the top done, I sanded all of the pieces up to 220 grit and then it was time to apply finish. I’m using Waterlox again on this build, and they’re also one of the sponsors of this video. I applied the Waterlox using a natural bristle brush this time, and I’d definitely recommend applying it this way. It was a lot easier to control the amount I was putting on vs using a foam brush like I’d done before. I really love the way it brought out a nice amber color on this Maple plywood as well, I think it looks great, and it matched the epoxy on the top step nicely. If you want to learn more about Waterlox, click here. I applied three coats of Waterlox, allowing it to dry roughly 24 hours between coats. The last step in the project was to add a few rubber feet to the bottom of the stool, to keep it from sliding around. Once the feet were installed, I added my stamp and the date, and the stool was done! I hope you enjoyed this woodworking project! This kid's step stool is a perfect beginner woodworking project and is extremely strong due to the dowel joinery. If you'd like to view more woodworking projects, check out my past projects.